London in the eighteenth century was a new city, risen from the ashes of the Great Fire of 1666 that had destroyed half its homes and great public buildings. The century that followed was an era of vigorous expansion and large-scale projects, of rapidly changing culture and commerce, as huge numbers of people arrived in the shining city, drawn by its immense wealth and power and its many diversions. 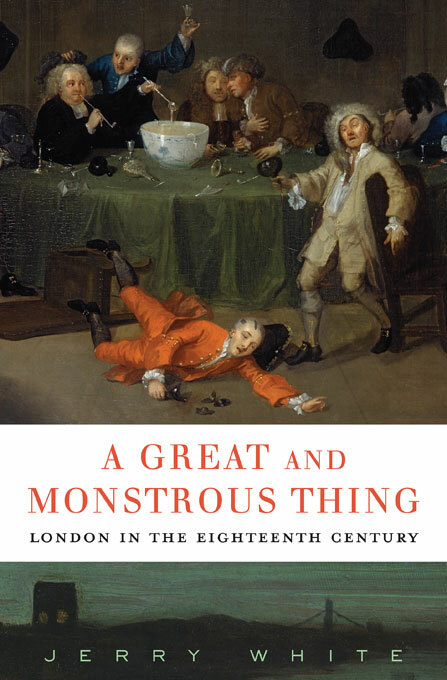 Borrowing a phrase from Daniel Defoe, Jerry White calls London “this great and monstrous thing,” the grandeur of its new buildings and the glitter of its high life shadowed by poverty and squalor. A Great and Monstrous Thing offers a street-level view of the city: its public gardens and prisons, its banks and brothels, its workshops and warehouses—and its bustling, jostling crowds. White introduces us to shopkeepers and prostitutes, men and women of fashion and genius, street-robbers and thief-takers, as they play out the astonishing drama of life in eighteenth-century London. What emerges is a picture of a society fractured by geography, politics, religion, history—and especially by class, for the divide between rich and poor in London was never greater or more destructive in the modern era than in these years. 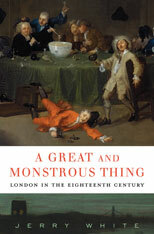 Despite this gulf, Jerry White shows us Londoners going about their business as bankers or beggars, reveling in an enlarging world of public pleasures, indulging in crimes both great and small—amidst the tightening sinews of power and regulation, and the hesitant beginnings of London democracy.